Kõan-like hand... left hand? Or right hand? Is this her right hand? Or left hand? Re: Kõan-like hand... left hand? Or right hand? Yes the case is quite abnormal but here is a family with abnormal hands. The case well illustrates how a stock of rather low mentality is often characterized by Physical Defects, which are evidently due to heredity though not identical in each generation. In answer to the question how far hand deformation can reveal low mentality in Palmistry I would say according to my experience that in such a severe case the subject is having a mental age of three to seven years only. I have found so. It is the criteria of medical people to research and decide how much physical deformation or defect reveal imbecile. The report you presented is from the year 1916 - which is fine, except that the described association with low mentality appears to be not confirmed by later studies. For, today medical experts describe that both 'polydactyly' (my example) and 'syndactly' (your example) usually do not indicate the presence of a mental handicap. "...incidence of all types of polydactyly to be 2.3 per 1000 in white males, 0.6 per 1000 in white females, 13.5 per 1000 in black males, and 11.1 per 1000 in black females." "It happens either as an isolated anomaly or as part of a syndrome. 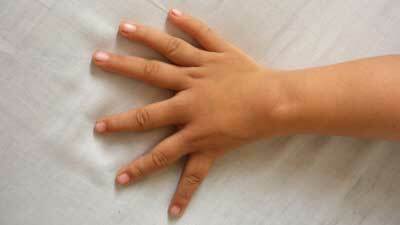 ... Syndactyly is thought to occur about once in every 2000 to 2500 births and is twice as common in males. Unilateral and bilateral cases occur about equally, and it is 10 times more common in whites than blacks." I have the opinion that Polydactyly - extra fingers -does not denote mental retardation or low mentality. It is quite common. But, now, I can take it granted that Syndactyly too -birth defects in which there is partial or total webbing connecting two or more fingers or toes- do not reveal imbecile. Thank you.